In Chapter 1 (“Collaborative Methodologies for New Media Research: Using Grounded Theory and Contextual Inquiry”), Joyce Neff, Liza Potts, and Carl Whithaus provide those interested in conducting research a flexible theory complete with the literature review and scholarly grounding demanded by some IRB committees. 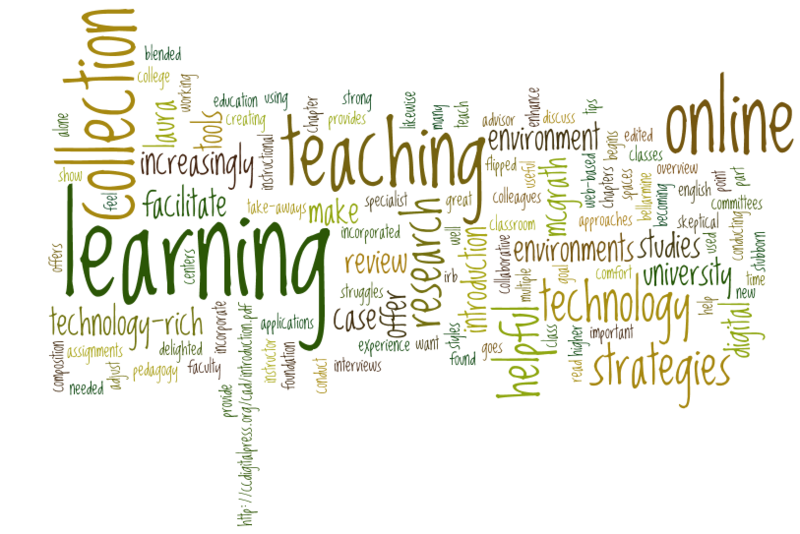 They offer both grounded theory and contextual inquiry as a basis for New Media Research: grounded theory because it is used by multiple disciplines and encourages the investigator to use the data collection process to generate ideas that can then be further explored and contextual inquiry because it emphasizes the importance of the participation of the research subjects. I’ve seen these approaches used in countless articles, books, and conference presentations with tremendous results. If you are privileged to work in a technology-rich learning space and would like to conduct research, this chapter will be very beneficial. 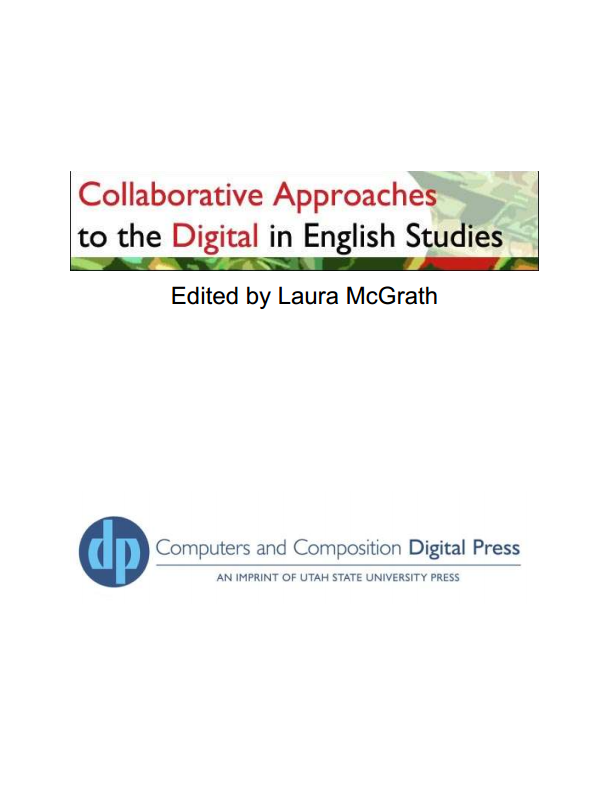 The second chapter (“Computing and Communicating Knowledge: Collaborative Approaches to Digital Humanities Projects”) by Lisa Spiro begins with an informative overview of the formation of digital humanities and offers case studies that demonstrate just how collaborative and interdisciplinary this field can be. Building on the foundation set in the first chapter, Spiro offers products resulting from the research methodologies. If you are studying technical communication or leading a class on the topic, this chapter should be on the syllabus, especially as it relates to the composition of digital products, as well as the study of research theory. Laura McGrath’s chapter (“Technology-Focused Collaborative Research Initiatives in English Studies: The Possibilities of Team-Based Approaches”) works seamlessly after the first two chapters: while they tell us how to research collaboratively, McGrath also shows why we should collaborate by offering a compelling look at labs (and whether we should even use the term “labs” or the term “centers”) and discussing the pros and cons of “big humanities.” McGrath makes a strong case to move away from the lecture model of teaching and provides useful tips for someone interested in moving that direction. If you need encouragement to stop lecturing, then read this chapter. 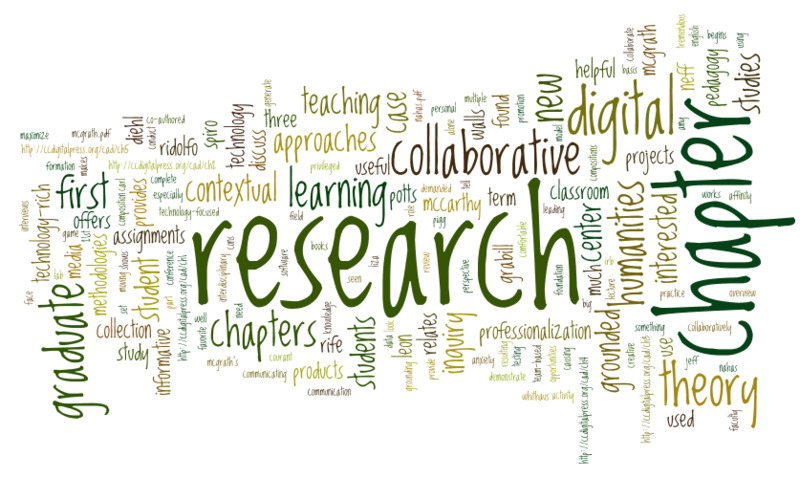 Chapter 4 (“Collaboration and Graduate Student Professionalization in a Digital Humanities Research Center”) by Jim Ridolfo, Martine Courant Rife, Kendall Leon, Amy Diehl, Jeff Grabill, Douglas Walls, and Stacey Pigg puts much of the first three chapters into practice as it incorporates interviews with graduate students (included as authors) who discuss their learning experiences through participating in a research center. While the first three chapters cover more of the director or faculty role in digital studies, this chapter provides the perspective of a graduate student, which will be very helpful to departments looking to maximize the learning opportunities and challenges graduate students face while working in technology-rich learning spaces. While I found all the chapters in this collection informative, my personal favorite was Chapter 5 (“Playful Affinity: A Case Study of the Digital Writing and Research Lab as a Collaborative Graduate Student Research Network”) by Sean McCarthy and Lauren Mitchell Nahas. Thier work addresses play pedagogy and how it relates to teaching with technology (something I’m very interested in and discuss in my co-authored book Teaching Creative Thinking: A New Pedagogy for the 21st Century). What I found very helpful was knowing that I am not alone in struggling with and testing the boundaries of low-stakes game activity with classroom assignments and compositions. If you are an instructor who wants to include new software and technologies in assignments and classroom projects, without causing too much anxiety for students who are not comfortable with technology, then this chapter will be useful to you.